I’m not really a sports fan, and Cricket has always struck me as a slightly longer and infinitely more complicated game of baseball. Daniel had started watching it soon after we moved here – he felt that he just couldn’t relate to anyone in his office unless he started understanding their game. And instead of just understanding it he took to it, like a cricket ball to the wicket (see what I did there? I made a very bad cricket joke). But soon, it began taking over even places where I frequented. It started with advertising: Bleed Blue from Nike; Change the Game from Pepsi; End Corruption in Cricket. Then it came with fans watching matches on outdoor screens and children feverishly playing with more frequency in every available open space. Yes, no matter how long and hard I tried, like the Superbowl before it, I could not avoid Cricket World Cup fever from being everywhere around me. I started to warm to cricket in Varansi when we came across a group of kids playing who thought it would be amusing if we joined their game. They giggled as we held the bat wrong and took wild swings. But they were enthralled – they all hooped and hollared with every hit and took immense joy in teaching us. I began to feel that if I could enjoy playing, then I could enjoy watching. So while in Khajuraho, Daniel decided it was high time for me to actually learn the rules. As the Aussies battled the Pakistanis he slowly and patiently went over the way the game is played. It really is unlike any sport I’ve watched, much further from baseball than it looks. I won’t go into the details, but its a game not only of agility and skill, but of mental planning and psychological consistency. It’s boring for the first four hours, but then really exciting for the last two. When India played its Quarterfinal match against Australia this week, I knew it was time for me to pay attention. The entire country was going to be involved and I wanted to be as well. India hasn’t won the World Cup since 1983 and this year its being played in India – everyone feels it is their time to win. And this match was slated to be an exciting battle between India and another cricket powerhouse, Australia. After idly watching the first four hours of the game at home (yes, it’s really that boring in the beggining), we went out to a restaurant with a huge projector and watched as India began to sink. With about an hour left it seemed like India’s hopes were about to be dashed. Everyone in the restaurant became antsy and the guards outside, watching the reflection of the game through the window, started to look sullen. But suddenly, they went on a roll. They started hitting 4’s and 6’s (yes, I’m using cricket terminology) and suddenly they were back in the game. 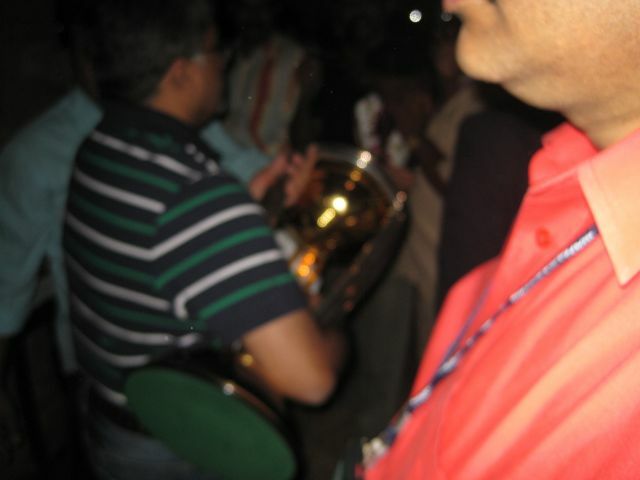 As the last overs started coming into view it became apparent that India was going to win. And when they did the whole restaurant and street outside erupted in jubilant cheers. India was moving forward. The catch to all this is that on Wednesday India will go to the semifinals – and play against their arch-nemesis Pakistan. The city will be excited and on edge. Fears of rioting and violence certainly hang in the air simultaneously with the excitement of an epic battle to the death of two of the World’s fiercest enemies (and, as with most enemies, two very similar peoples). There is a bit of diplomatic hope that rings in all of this – The Pakistani Prime Minister has accepted an invitation from India’s Prime Minister to watch the game together. It will be the first time a match between the two teams has occurred since the attacks on Mumbai in 2008. It’s definitely an exciting moment to be here. And as a new-found fan, I will be watching.